"It is the notion of singularity, as distinct from the universal-particular dyadic relation, that constitutes the telos of the hermeneutic practice of postmetaphysics. More precisely ... singularity is the key theme in the discourse of ontological hermeneutics as it is articulated in Heidegger and Gadamer. Singularity, it must be asserted, is not tantamount to the notion identity, let alone totality. 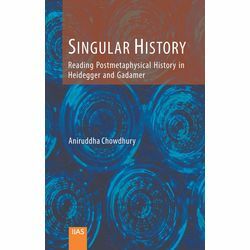 The concept of singularity, or better singular-universal, to use the expression in order to distinguish the concept from any particularism, is inseparable from the notion of alterity and the essential non-self-identity of 'identity'."